Is your company’s current HR software out of date? Do you have an online system for employees to use? If you’re not satisfied with your business’s current HR system implementation, it may be time to decide if an upgrade is on your road map for the next year. To implement HR software is an arduous, important task that every company should treat with care, and there are many different elements to manage during the process. Five of these factors: time and budget, the project team, a phased implementation, data security and potential risks — are the top key considerations to keep in mind. With the right HR system in place, businesses can operate with agility. Due to the immense value of these HR solutions, there are many vendors which offer these systems to companies. The process of selecting a software provider can be time-consuming and expensive. It’s critical for organizations to do it right the first time. You should also remember that HR systems are not plug-and-play. They need to be tailored to the particular demands of a company. Therefore, the very first step of adopting a human resource management system begins way before implementation. You need to think about the features that will best serve the needs of your business and decide on a vendor based on those requirements. Choosing a platform is only a portion of the HR software implementation process. Once you have made a decision, it is time to consider how your business will bring the system into your organization. A successful implementation will involve the evaluation of all present risks and the acceptance of feedback from all stakeholders. Plans for HR system implementation should be made with the influence of these factors under heavy consideration. The quickest ways to disappoint during an HRIS implementation, especially in the eyes of senior management, is to go over budget and past your “go-live” date. The best way to stay on time and within budget is to set proper expectations up front. No leading with “best case scenario” or “if we cut a corner here, we can save this amount of money” – only the truth will do. Everyone will be happier for it. Although, you should build in a small contingency budget as a buffer, say 10 percent or so. Your budget should be established once you choose a vendor. Knowing the price of the actual system will constitute a large portion of your budget planning. However, there are a number of different variables that can arise during the implementation project, affecting your planned budget and timeline. Labor, technical issues, infrastructure adjustments and other potential impacting forces on time and budget should all be accounted for. A written plan detailing the scope of the project, along with objectives, proposed budget and general timeline will help you stay on track. Stakeholders will work towards the same documented goals, limiting miscommunications and settling disagreements. This document will include all functionality, as well as workflows and reporting. Functionality is sorted beforehand, so there will be no last-minute requests that could impact budgeting. The project plan is unique for every company, as the system conforms to specific business needs. Get employees, the actual end-users, involved in the implementation process as soon as possible. You’ll get critical perspective from both management and individual contributors. Be sure to include key departments in the process, such as IT, payroll, finance and recruiting. There will be a host of changes to communicate to employees in all departments, so having inter-departmental acceptance is important. The inclusion of teams outside of your HR department and upper management will assist in maintaining other key considerations as well. For example, your financial teams will make sure the project adheres to the budget. Your IT department can manage security measures and handle any kind of technical mishaps. Technical knowledge on your feedback team is preferred, but not required. The HRIS team leader and management should choose the feedback team with care. You should pick those who are willing and have the availability to help. Plus, you should also choose employees that are known to give helpful, constructive feedback. As the phases of implementation are completed, listen and react to the feedback given by these stakeholders. Alter the roll out as needed, and see what can be done to improve the functions or employees’ understanding of them. To make post-launch training easier, involve departmental leaders in the feedback process. They will be liaisons between employees and the HR team. Managers can communicate the status of the implementation process to their teams and collect input from employees. The inclusion of division leads will keep everyone informed and ensure end users are satisfied with each step of implementation. When managing a human resource software implementation, it is best to complete the project step-by-step. Meanwhile, your team should be assessing each phase and evaluating the state of the implementation as you go. A phased HRIS implementation has a few benefits. The prioritization of requirements helps the HR managers, employees and other key stakeholders understand the system better as it is introduced piece-by-piece. That way, throughout each phase of the implementation, less information is needed to be communicated and retained. By phasing the implementation, it can be ensured that each module has been designed, tested and approved. This is superior to the possible alternative of bouncing back and forth or moving on to another module without the go-ahead. Rework and reengineering is expensive, so getting it right the first time is crucial. Celebrate wins and phases completed along the way by sending out a company-wide newsletter. This builds confidence within the project team and keeps employees abreast of progress. Regular communication is important for change management within the company, as well as keeping track of issues as they arise for employees. A phased implementation process also reduces “scope creep,” in which extra functionality is requested by stakeholders, holding up the timeline or adding to the budget. By keeping the entire network involved in the implementation process and providing updates at regular intervals, everyone can interject when they feel necessary. Adjustments can be made to the project before it is too late. When working with sensitive data, you can’t be too careful – and HR departments house most, if not all, of the sensitive data at a company. The HRIS will most likely have profiles for employees with contact, salary, insurance information and job history information displayed. This personal data must not be compromised during the transition phase. To safeguard employee data, work in conjunction with IT throughout the implementation process and employ their expertise. Your IT department is the best resource for ensuring your data is safeguarded. Make sure your team has a plan in place for the backing up and safe transfer of employee data housed in your HR system. During HRIS selection, ask critical questions about the security features of each potential system, too.  It may also be helpful to contact the vendor of the HR tool you currently have. Your in-place system may have its own security and data backup features that can aid in the movement of information from one platform to another. 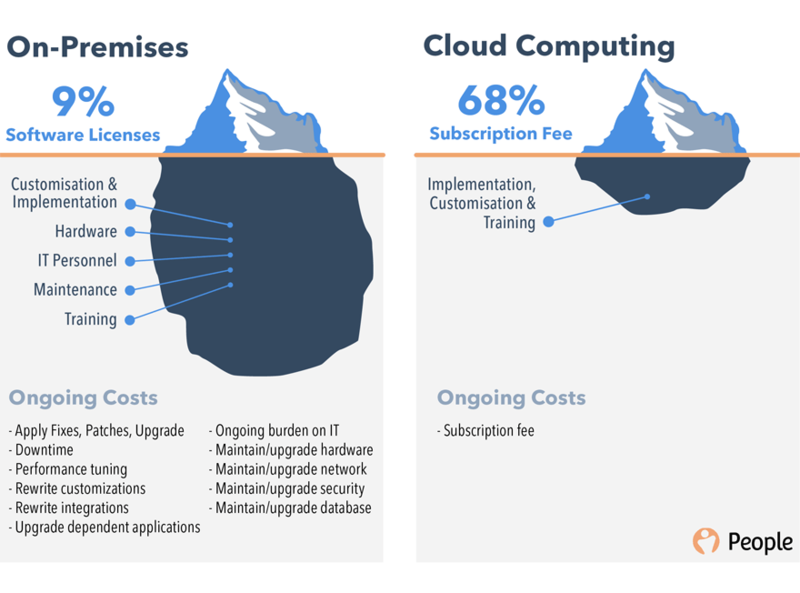 As mentioned in our first key consideration, a couple of risks in the implementation process are going over budget and past the anticipated go-live date. In our fourth key consideration, we discussed the security risks that present themselves. How much support is senior management providing? Could any upcoming projects within the company push this to the back burner? Which departments within the company may be more resistant to this change than others? Do any changes or adjustments need to be made to infrastructure to aid implementation? This list illustrates some universal risks that can arise during an HR software implementation project. Furthermore, there could possibly be other risks specific to your company. Your business’s awareness of these risks will be key to the success of the project. Of course, these additional risks all relate to time, budget and security. Any unaccounted-for issues can potentially cause your implementation to extend past the expected timeline, go over budget or compromise company information. It is essential to evaluate all risks and have a plan established for all possibilities. If you’re looking to upgrade your system soon, consider hiring an HR implementation consultant. With the help of a knowledgeable HRIS resource on board during the implementation process, your business can save time, money and headaches. An HRIS partner will know the risks and can troubleshoot when the inevitable issues arise during the complicated time this project rolls out. As repeatedly stated, you should never underestimate the effort required of an HR system implementation project. Because this is such an important task, it is essential to have a plan in place that examines your business’s budget, timeline, stakeholders, security measures and risks. This list of key considerations is a framework for creating such a plan and supplying your organization with the ability to proceed through your implementation process with confidence. 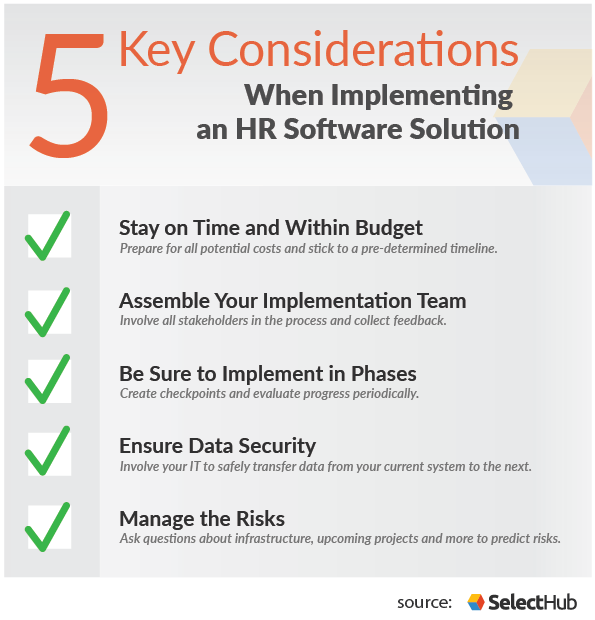 What are your tips for human resource software implementation? Let us know in the comments!